With a capacity of 350ml, this nautical mug features an interlocking surface pattern, brand stamp, exposed glaze line and is inspired by shrimps dancing along the sea floor. A member of the new Bert & Buoy ceramic family, this mug was created collaboratively by designer and illustrator, Bert Fowler, and renowned ceramicist, Keith Brymer Jones. 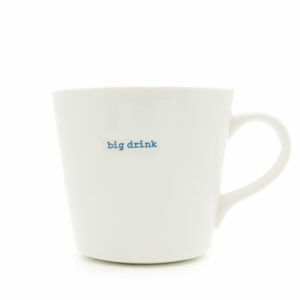 Presented in a designer gift box with a gift tag, every mug is both microwave and dishwasher safe. Inspired by a life lived and loved on the coast, each illustration was originally sketched by Bert Fowler in his South Devon studio before being transferred onto a uniquely shaped and designed mug by master potter, Keith Brymer Jones. Representing how shrimps appear to dance around in their natural habitat, this design compromises of bold, black lines and a splash of trendy pink. Meticulously crafted from light-grey stained porcelain to mimic a beach pebble, the So Shrimp mug is striking enough as a solo piece and stunning in amongst the other Bert & Buoy mugs.